Discover meze dining this summer at Lokanta. Our Summer Meze Fortnight runs from Tuesday 21 August – Sunday 2 September 2018. During this time we are going meze only at Lokanta. This reflects the summer trend for Mediterranean style dining and allows us to focus on the smaller fresh dishes rather than starters and main courses which we find are more popular in the winter months. When we first opened Lokanta in 2009, meze were the lesser known cousin of Spanish tapas. We were often described as the Turkish tapas place. 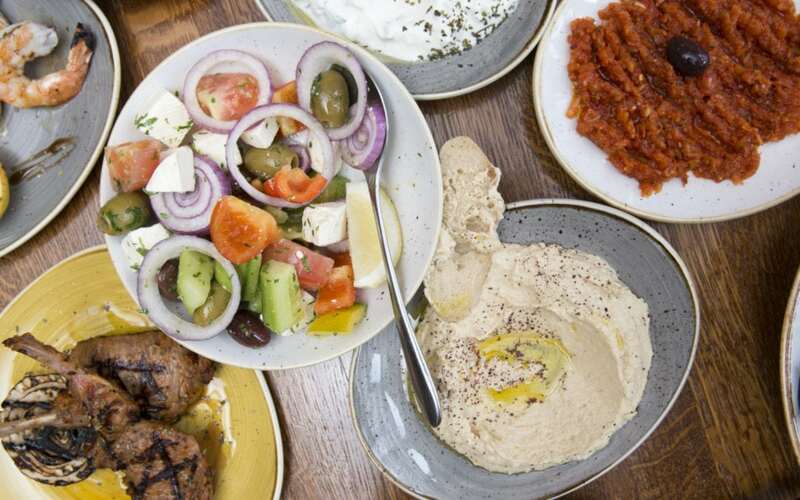 In the years since then we have seen our style of Eastern Mediterranean food take a greater place on menus and supermarket shelves around Britain and so there is a greater confidence in ordering and enjoying these dishes as a meal out. Our menu has not changed much over the years as we find customers come back for dishes they have already tried or been recommended and we like to keep things consistent. We have the most commonly known meze dishes on our menu such as hummus, falafel, aubergine puree, stuffed vine leaves. In addition to these our small plates contain a lot more variety. We divide our menu in to hot and cold and then group the dishes according to whether they are vegetarian, meat or seafood. Customer favourites include our pan fried lamb’s liver, blue cheese mushrooms and calamari, grilled or fried. How do you make a meal out of meze? The trick is to order dishes to share and to mix and match across the hot and cold categories. For example on our meze menu we have lamb chops, mini kebabs and even filets of sea bass. Mix these in with some courgette fritters, cous cous, feta cheese rolls and perhaps an aubergine salad and you quickly build a varied meal to share. If there is something you particularly want then order that dish for yourself rather than sharing such as some grilled halloumi or the lamb chops. You can always add sides of rice or potatoes. Feeling inspired to try it at home? There are some great recipes online here. This style of Mediterranean dining is perfect for socialising. Enjoy good company while eating a variety of food and catching up with your friends or family. The best way to order for a group of people eating meze at Lokanta is to choose our meze banquet. We used to offer these for Christmas parties and special occasions but they work so well we now have them always available for groups of four people or more on our main menu. There are two versions below. Choosing the meze banquet means plenty of food without the decision making or any awkward bill splitting. Let us bring you our recommendations and you can sit back, relax and enjoy.